I am 44 years old, although I do look very young, as young really as my pupils! I like being a teacher and I get true enjoyment from sharing my knowledge and skills with new learners, making them realize how easy learning can be and how much actually they do know already. I like helping young people enjoy learning and making learning easy for them. I am patient and adaptable and easy to talk to. I always discuss the needs of my new pupils very carefully and aim to build their confidence in the subject. As an Examiner for EDEXCEL Maths GCSE, I am able to help my students to maximise their potential using targeted revision and exam techniques. I have been a teacher for 14 years. I have always wanted to be a teacher. I have worked in several schools now in the area, including Lord Lawson School and Emmanuel College gaining experience from working with a variety of learners of various ages and learning styles. I have worked within the requirements of more than one examining board, therefore I am quite familiar with all exam formats. I have been a private tutor for 14 years with very good results. Students do like me within first session, gaining confidence and self- reassurance that they are capable of a lot already, as in most situations only some issues need re-addressing, building on the prior knowledge. Emmanuel College and Cardinal Hume School are recommending me as a maths tutor to their interested pupils, as they have worked with me and they do know me personally, as well as aware of the very positive feedback I receive from my tutees. In the first session, I discover the individual needs of my learners: their strengths and weaknesses. Then I devise a plan to address the whole programme of study within the number of weeks available, so no topic is ignored. I work simultaneously on exam requirements, but also on skill development, skills that the student can benefit from, outside the boundaries of a specific exam format. Students find themselves forgetting the time, often engrossed in their work, mentally challenged and stimulated. I set short homework at times, so that students can practise independently on those skills they develop with me, being reassured that they can transfer those skills further. I do provide learning materials which I do personalize for each student. Marina has been excellent. Ellie is doing better and is very happy working with Marina. I would highly recommend this tutor. So far myself and my son have found Marina to be a superb tutor. Dedicated, hard working, and wants the best from her pupils, at the same time as being flexible and friendly. 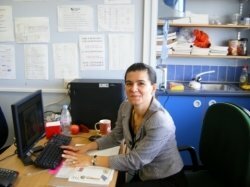 Marina is a lovely, friendly tutor, who is flexible when arranging tuition times. My daughter has been making exceptional progress under her tutelage in only a few weeks, showing the confidence that Marina has been able to bring out in my daughter. What an honour to teach such a student: intelligent, competitive, hard-working, super modest and polite! Excited to work with such a lovely young lady who values education and has made huge progress in only a few week! The end of year test scores in both Maths and French we have been working have gone up 25%, credit to her efforts and commitment!